Separation distress can severely reduce the quality of life for both you and your dog and is a common rationale for owners abandoning dogs at shelters. Ethologists believe separation anxiety is caused or exacerbated by congenital factors, excessive isolation from the dam or littermates during early developmental periods, a lack of preparatory isolation from the dam or littermates during early developmental periods, and traumatic experiences that occur when a predisposed dog is isolated and/or confined, or any combination of the preceding. In addition, rescue dogs, dogs exhibiting other forms of anxious or phobic behavior, and excessively “clingy” dogs are more predisposed toward developing separation distress behavior. To a lesser degree, dogs owned by clingy or cloying owners and dogs that lack training or structure are also more predisposed toward developing separation distress behavior. Separation anxiety/distress can be a difficult behavior to resolve. Nevertheless, there are solutions that often provide significant improvement. To maximize effectiveness, the solutions need to be implemented conjunctively, which provides synergies that raise the probability of successful behavior modification. The goal of the solutions is to increase predictability where a lack of predictability creates an anxious emotional state, to create unpredictability where predictability creates an anxious emotional state, to create diversionary and displacement behaviors that reduce the severity of the anxious behavior and/or the dog’s focus on the owner’s departure, and to psychologically, physically, and physiologically create a state of relaxation. When re-ordering your departure routine, take some of the more important trigger activities that occur later in the ritual and move those activities earlier in the process. For instance, place work items in your car, open the garage door, move your car onto the driveway, close the garage door, and then return inside to eat breakfast and shower, rather than postponing the car-related activities until the moments immediately preceding your actual departure. In addition, you can get dressed in work clothes before taking your dog for his morning walk, instead of saving formal dress and makeup until later in your departure ritual. 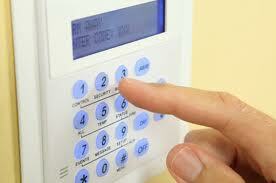 Randomly type into your alarm keypad throughout the day to desensitize your dog to the activity. Often there are key components of your departure routine that particularly trigger the onset of distress behavior. Typically, the key provocative activities are behaviors that occur exclusively when you depart, such as providing your dog a bone or chew toy, crating or enclosing your dog, applying makeup, getting dressed in specific work clothing or footwear, placing briefcases or purses in your car, grabbing car keys, starting your car, opening the garage door, or typing onto a burglar alarm keypad. Again, we wish to destroy your dog’s assumptions of predictability by creating randomness to the actions. Therefore, if you own a dog exhibiting separation distress, perform any of the preceding actions spontaneously and randomly throughout the day, regardless of whether you depart. In addition, you may wish to perform some or all of your workday departure ritual on a weekend or holiday when you don’t plan to leave your dog isolated in the house. Subsequently, the departure activities will reduce in predictive quality and your dog may become less distressed when observing the events. Modifying the visual, auditory, olfactory, tactile, and taste sensory environments prior to or upon departure can create an emotional state of relaxation in an otherwise distressed dog. Some dogs relax and nap when placed in a dark room with no lighting and closed curtains. However, other dogs realize that darkness during daytime is an unnatural state. Thus, they become more distressed when placed in a darkened room. Such dogs will often do better in a well-lit room that has an uncovered window with access to the outdoors, where they can observe people and wildlife. We recommend videotaping your dog with each lighting variation to ascertain which visual environment is most productive. Altering the auditory environment by incorporating a white noise machine that can produce either technical white noise or “pink noise,” such as sylvan or oceanic sounds, can provide great benefit. The white/pink noise machine can assist in diverting your dog when you depart, as the device will create ambient noise that may reduce the impact of potentially distress inducing external noise, such as the garage door opening/closing. In addition, after you depart the repetitive low volume sounds will likely assist in creating psychological displacement that relaxes your dog during the period that he/she is isolated. The olfactory nerve is connected directly to the limbic system, which affects impulse behavior and emotions. Therefore, aromatherapy can have a tangible effect when reducing or converting an anxious emotional state to one composed principally of relaxation and confidence. Natural lavender potpourri, diffusers, oils, or sprays can help to relax animals when applied several minutes prior to departure. Alternatively, commercial pheromone products, such as DAP® or Comfort Zone®, may provide an aromatherapy solution. However, CPT’s anecdotal data suggests that lavender is usually the most productive olfactory solution. 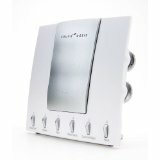 A white noise machine can be highly beneficial in displacing and relaxing dogs exhibiting separation distress. Tactile sensory solutions may include changing the floor surface where your dog is confined, providing play toys for your isolated dog, providing chew items, or changing the temperature of the room where your dog is maintained. Some dogs are more comfortable on a soft surface, such as carpet, a towel, or a blanket. In contrast, other dogs relax better on cool surfaces such as an air conditioning vent, tile, or a metal crate pan. Use personal observation or videotaping to determine which substrate is most pleasing to your dog. Play toys, such as large balls your dog can roll, Buster Cubes® or similar toys that randomly disperse food, squeaky toys, or tennis balls, may provide tactile and taste (gustatory) sensory solutions that displace anxious behavior and reduce focus on your departure. Likewise, chew items, especially sterilized bones (which can be stuffed with food), compressed rawhide, tug ropes, nylabones®, gumabones®, or natural deer antlers can employ the gustatory sense to divert focus from your departure and to create a dopamine release that contributes to an emotional state of relaxation. When selecting a chew product ensure that your dog enjoys the selected item, that your dog will use the item even when aroused by developing levels of anxiety, and that the product is safe for your dog- some dogs may break teeth on overly hard chew items, ingest shards from crushed hard chews, swallow squeakies, ingest incompletely chewed rawhide strips or bones, ingest strands from rope tugs, or develop diarrhea from consuming rawhide or nylon chews. From a room temperature standpoint, some thin, short-coated dogs prefer a warm room and a warm surface area. Therefore, during winter months, you may wish to turn up the heat, provide a space heater, and confine your dog near a HVAC vent. Likewise, during summer months, turn down air conditioning and turn off ceiling fans. Conversely, if you own a thick double-coated dog, you may wish to reduce the heat during winter months, keep them away from hot windows where the sun fully shines, and provide a room fan or ceiling fan, and similarly turn up the air conditioner during summer months. Determining the optimal enclosure/containment environment is an important part of the behavior modification process. If your isolated dog is likely to chew parts of your home, expensive loose items, or items that are potentially hazardous, then your dog needs to be confined for financial and safety reasons. Similarly, if your distressed dog regularly becomes incontinent, you may wish to confine your dog to a room that is easily cleaned. On the other hand, many times isolation itself or the specific isolation environment exacerbates existing stress. Consequently, the enclosed dog may experience heightened levels of separation distress symptoms and greater risk of injury. Dogs with severe enclosure anxiety may break teeth or nails from escape attempts or damage their skin/hair from self-mutilation. Some dogs feel safe and relaxed in a wire crate that provides ample 360-degree visibility. However, other dogs feel more secure in a more enveloping enclosure, such as a plastic Vari-kennel. Most double-coated dogs and many short-coated dogs prefer the cooler temperature and superior circulation available via the aforementioned more open wire kennel. However, some short-coated dogs may feel more comfortable with the warmer ambient temperature provided by the Vari-kennel. Nevertheless, a certain percentage of distressed dogs exhibit severe enclosure anxiety or outright claustrophobia. They become distressed when placed in either type of crate, even when family members are home, but with the symptoms exacerbating tremendously when combined with isolation. Fortunately, there are confinement alternatives to a wire or plastic crate. An exercise pen that provides more room, is taller, and does not have a top may become an excellent solution. However, if your dog exhibits confinement anxiety inside an exercise pen, the exercise pen costs more than you wish to spend, or the exercise pen is too bulky for your household, you may wish to tether your dog with a chain leash to a piece of furniture. If you elect passive tethering, tether your dog in an area of the house where your dog is most comfortable, can not inflict much damage, and is safe from hazards. Alternatively, if your dog resists tethering, gets trapped in the tether, chokes himself by pulling on the tether, or exhibits barrier frustration, then consider confining your dog to a baby-gated bathroom, bedroom, or kitchen, where your dog is comfortable, can not inflict severe damage, and is safe from hazards. On the other hand, if your dog manifests his/her separation distress by behaviors other than chewing, incontinence, or property damaging escape behavior, then confinement may not be necessary. By videotaping and collecting data regarding the frequency, severity, and duration of pertinent separation behaviors correlated to your dog’s placement in various enclosure alternatives, you can determine which enclosure solution is optimal- or whether freedom is optimal. Often owners inadvertently exacerbate separation distress by providing excessive communication immediately prior to departure. Rather than saying, “Bye, bye,” or “Mommy will miss you; I will be home soon,” leave silently. Make departures as uneventful as possible. In addition, divert your dog via a play toy, a chew item, a treat, and/or background noise, so that your dog does not immediately notice your departure. Similarly, make arrivals as uneventful as possible. Discourage arrival barking, restlessness, running, and jumping. Upon arrival, ignore your dog until he can sit calmly. Then, provide attention and affection. Do your best to control your dog’s impulsive, excitable, anxious behavior by exclusively rewarding calm, relaxed behavior. Prior to leaving, divert your dog via a play toy, a chew item, a treat, and/or background noise, so that your dog does not immediately notice your departure. We believe in the maxim that “a tired dog is a happy dog and belongs to a happy owner.” Proactive stimulation is designed to productively fatigue your dog 24/7 and especially immediately prior to departure, so that your dog is naturally diverted, welcomes alone time, and is more inclined to assume a relaxed emotional state. There are three types of proactive stimulation: sensory, physical, and mental. Proactive sensory stimulation can easily occur via more frequent and/or lengthy walks, whereby your dog gets to see, hear, smell, and touch novel stimuli. A long walk within an hour of departure can serve to better relax a normally separation distressed animal. Proactive physical stimulation consists of rigorous exercise, such as running, bicycling, roller-blading, swimming, ball sprints, or Frisbee. In addition to getting your dog physically tired, rigorous exercise can favorably alter brain serotonin levels to the same degree observed with SSRI medications. 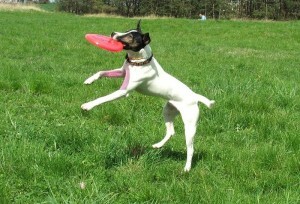 Select the exercise activity that your dog most enjoys and that best fits with your schedule and abilities. Rigorous exercise for 20 minutes completed immediately prior to departure can be highly effective in reducing separation distress behavior. When planning exercise, save time for water replacement and a bathroom opportunity afterward. Moreover, to reduce the risk of stomach torsion/bloat (a potentially life threatening condition), do not feed until one hour after exercise and do not exercise until two hours after feeding. Please note that to best take advantage of limited morning time and to accelerate productive fatigue, exercise must consist of a high-intensity activity. Unless the temperature is very hot, your dog is of senior age, or your dog is obese, walking is not exercise- it is only sensory stimulation. Therefore, to supplement a walk or in lieu of a walk you may wish to consider the high-intensity activities recommended earlier in the paragraph. Proactive mental stimulation consists of obedience, agility, trick, or scent training. For 10 to 30 minutes per day, practice basic commands with your dog, so that he/she performs the commands more reliably and responsively. Alternatively, increase your dog’s skill level and breadth by teaching him/her new commands, agility, scent detection, or tricks. Challenge your dog mentally to productively tire your dog and to provide yourself tools that better enable you to manage your dog’s behavior. h. Patience and sitting (in lieu of jumping) during greetings. 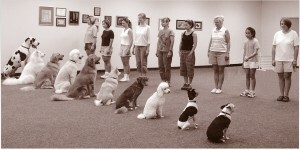 Whether your dog is large or small, a group class can be a great place to teach your dog the foundation behaviors required to institute formal impulse control protocols. Many ethologists believe that certain types of separation distress behaviors emanate from puppyhood, where a young dog will normally whine to inform his/her mother that he/she is lost, to call his mother back to the den, or to communicate hunger. These normal behaviors usually disappear as the puppy matures. 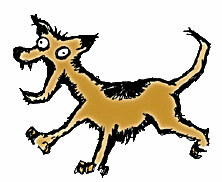 However, in the case of separation anxious/distressed dogs, the preceding behaviors abnormally continue into adulthood. Moreover, some ethologists believe that certain types of separation behaviors (especially barking, whining, howling, racing the owner to the doorway, blocking the owner from departing, or biting the owner) are in part dominance behaviors, where the dog is in essence commanding that the owner not depart or immediately return. In such cases, we advise the inclusion of Leadership Communication Training (LCT). To complete LCT, you should be highly consistent with all the ICT protocols. In addition, you should remove your dog from all positions of height, such as beds or doorways, highly control and structure all play and exercise activities through the implementation of a leash and/or commands (e.g., “take, bring, give” to sequence stages of a retrieve game), teach your dog to down stay for at least 5 minutes, and teach your dog more intensive and higher levels of positive reinforcement-based obedience, whereby you assume a strong, yet benevolent and mutually enjoyable leadership position. Moreover, you will wish to implement appropriate modulations in your command, praise, and rebuking voice. Canine verbal communication is not comprised of words. Rather, canine verbal communication consists of sounds that vary by pitch, duration, frequency, and volume. State commands with a frequency of only one time before gently enforcing the command. When considering pitch and volume, use as non-strident a voice as possible whereby your dog will still obey. However, don’t use too placid a voice, where your dog may not take you seriously and is likely to ignore a command. Consider your dog’s general temperament, his current mood state, his relationship with you, his attitude toward the specific command, and the amount of distractions present when deciding upon the proper modulation of a command. When praising, consider whether you wish to reward or promote dynamic or static behavior. For instance, you will wish to effervescently praise a fast recall or a fast response to a sit command. However, you will wish to calmly praise a dog that you wish to remain in a stay position. Feel free to repeat your praise communication. In addition, use a higher-pitched voice than you will for most commands and manage the volume to a level most appropriate for your goals and your dog’s pleasure. When verbally rebuking, commence the reprimand immediately upon the commencement of the infraction and cease the reprimand immediately upon the cessation of the infraction. You will want to mimic the deep pitch of a growl, but by saying, “No,” “Quiet,” or “Off.” Vary the pitch, volume, and duration so that you will obtain compliance, but use the minimum amount to obtain compliance so that your dog will not become overly frightened and so that you will not jeopardize your relationship with your dog. Nevertheless, with rare exception, do not verbally punish a dog who exhibits undesirable behaviors from maladaptive anxiety or distress, as you risk exacerbating the root cause of the undesirable behaviors- the anxiety itself. In addition, in the majority of cases, rather than focusing on reprimands to punish undesirable behaviors, instead emphasize positive reinforcement to teach appropriate replacement behaviors. Effective pack leadership starts with proper communication. Although proper modulation of verbal communication is important, if you truly wish to become perceived as a pack leader you will need to learn to emphasize proper physical postures and communication over verbal communication (we believe “silence can be golden”). Unstable and juvenile dogs are more likely to emphasize verbal communication. 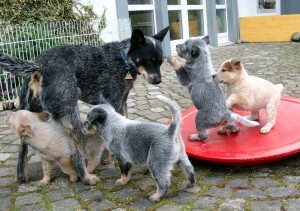 In contrast, a stable, pack leader dog uses an economy of verbal communication. He instead emphasizes body language when communicating to fellow pack members. Therefore, we recommend that owners learn how to communicate via appropriate posturing, so that words become less necessary for your dog to understand and/or comply with your communication. Furthermore, when wishing to obtain compliance with a refractory dog, you will wish to stand, provide full frontal shoulder contact (square shoulders), look directly at your dog without staring, and move toward your dog’s space. Be careful not to frighten your dog or prompt retaliation. We wish to earn respect not provoke fear. Conversely, if you wish to show comfort, acceptance, or play, then get lower to the ground, remain stationary or move sideways- not toward the dog, and employ a loose body posture. If you desire more detail or personal assistance and feedback, CPT teaches effective leadership communication skills in a targeted in-home private behavior modification lesson. Random departure behavior modification drills create beneficial unpredictability regarding the length of your departure. Set your dog up as if you are going to depart. Then, leave for only 15 seconds. Do not return unless your dog is calm and quiet. If you cannot easily determine whether your dog is calm, consider using a closed circuit camera that you can obtain from a spy store or discreetly placing a spotter with a cell phone inside your house. Once your dog is regularly calm with you departing for 15 seconds, lengthen the duration to 30 seconds. However, consider 30 seconds as a maximum duration. Randomize the length of your departure so that some departures are less than 30 seconds. Again, do not return unless your dog is calm and quiet. After your dog is regularly comfortable with a 30-second departure, gradually increase the duration of the maximum departure to 1 minute, 2 minutes, 5 minutes, 10 minutes, 15 minutes, 30 minutes, one hour, and longer, while randomly interspersing many shorter intervals between the repetitions extended to the maximum duration. Homeopathic remedies, such as Rescue Remedy or melatonin, may reduce your dog’s general or immediate anxious state. Similarly, a nutraceutical product called “Composure” may also help. You may also wish to consider a pheromone product called DAP, lavender aromatherapy, or a wearable garment called Thundershirt to alleviate your dog’s anxiety. You can purchase the preceding homeopathic, nutraceutical, pheromone, aromatherapy, and garment products online without a prescription. In addition, various pharmaceutical products work well to reduce the anxious state of distressed dogs. Novartis completed FDA approval of its tricyclic antidepressant/anti-anxiety medication clomipramine for the specific veterinary purpose of reducing the effects of separation anxiety in dogs. Novartis markets and packages the drug for dogs as “Clomicalm,” which sounds much nicer than clomipramine. Clomicalm is available by prescription from veterinarians. Since dogs have the same neurotransmitters as humans, many other human anti-depressants and anxiolytics have also been found helpful in reducing anxious behavior in canids. Therefore, if Clomicalm is unsuccessful, speak to your veterinarian about adjusting the dosage, switching to an alternative anxiolytic medication, or combining a tricyclic antidepressant (TCA) with a benzodiazepine, such as Valium. If the latter strategy is used, you will administer the TCA daily and administer the Valium prn only on the days you depart, about a half-hour before you depart. The role of the TCA is to revise general systemic neurotransmitter levels so that your dog remains less anxious at all times. The role of the benzodiazepine is to reduce sensory inputs and relax your dog immediately before departure, during departure, and for the first hour or two after departure, when distress symptoms are usually most pronounced. If your dog does not respond well to Clomicalm or in lieu of Clomicalm your veterinarian may prescribe Reconcile, the veterinary version of Prozac/fluoxetine. Eli Lilly’s veterinary division received FDA approval for the use of fluoxetine in treating canine separation anxiety. Clomipramine and fluoxetine are the only two drugs to receive FDA approval for such purposes, although your veterinarian off-label may prescribe drugs approved for other purposes. Reconcile comes in flavored chewable tablets. Therefore, if your dog does not readily accept pills, you will likely prefer Reconcile to Clomicalm. The CPT article entitled “Psychopharmacuetical Options for Canine Thunderstorm Phobia, State Anxiety, and General Anxiety” will have more detail about each of the above listed solutions. Please note that homeopathic remedies and pharmaceutical medications work best when combined with the behavior modification protocols described in the preceding sections. The role of homeopathic or pharmaceutical products is to physiologically reduce your dog’s general anxiety level, so that your dog is better able to relax and can concomitantly cognitively process the information inculcated during the behavior modification process. Consequently, if all works according to plan, your dog will intrinsically and cognitively overcome his/her separation distress, whereby the remedy or medication can be weaned and eventually eliminated from the solution plan. Nevertheless, if your dog has a severe or highly refractory case of separation distress, to maximize the probability that symptoms do not recur or remain reduced in severity, both behavior modification protocols and medication may need to remain implemented for the remainder of your dog’s lifetime. Lastly, as part of the solution plan, we recommend videotaping to ascertain which solution alternatives provide therapeutic outcomes. 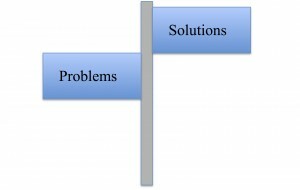 Many parts of the above solution plan involve choices, as there is no universally effective one-solution-fits-all plan. To determine which choices are optimal or whether solutions are working effectively (e.g., dark or light room; crate, x-pen, gated room, or freedom; which play toys or chew items interest your dog; how long he whines, barks, or howls) videotaping provides an excellent resource. After reviewing the tape, you can judiciously revise choices and productively tweak the plan. The above article is written principally for informational purposes. Since separation anxiety is often a complex condition that is difficult to resolve, significantly lowers the quality of life of both the human and pet, causes notable financial damages, dramatically reduces the joy of pet ownership, has owners often feeling shackled to the house, and prompts owners to abandon dogs to animal control or a humane society where there is a high probability of euthanasia, we highly recommend the services of a skilled CPT trainer/behaviorist when diagnosing the condition and implementing a customized solution plan. To schedule a CPT behavior modification session, please contact the CPT office by phone at 404-236-2150 or contact us by e-mail via the Contact link at the top right of this web page.